Ever been shark fishin? Let's go! Just minutes from the inlet you are in the Atlantic Ocean fishing for Kingfish up to 50 lbs, Barracudas up to 40 lbs, Amberjacks up to 50 lbs, Tarpon 30 to 200 lbs, and also Tuna, Dolphin, Wahoo, Sharks, and the occasional Billfish. We also have great bottom fishing as well for Snapper, Grouper, Seabass, African Pompano, and you just don’t know what else you might hook up unless you are fishing with AC Charters Inc. When fishing the flats of Cumberland Sound to Nassau Sound aboard the “Kodak Moment” (22’ Pathfinder Powered with 200 hp Yamaha) with Capt. Allen Mills, you will know you have accomplished the Anglers Dream, whether on a Fly Rod or Ultra Light Tackle. The oyster beds are the home of many fish: Redbass, Trout, Flounder and many more. The river system holds big game as well: Tarpon, Sharks, Cobia. You will find the best sight fishing on the grass flats for Tailing Reds, Sheepheads, and Drum on the spring tide. Average size of the Redbass are 3 to 14 lbs; Trout range from 1 to 10 lbs; Tarpon range 30 to 200 lbs; and Sharks range 10 to 250 lbs (Blacktips, Dusky, Bonnethead). 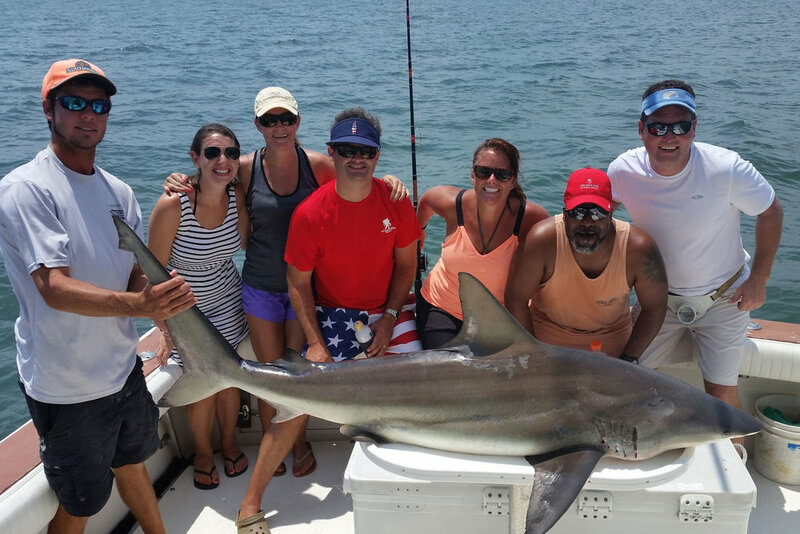 If you are looking for an Amelia Island offshore fishing adventure that you will never forget, click below or call us at 904-261-9481. Capt. Allen has been fishing for over 38 years from Fernandina Beach, FL. down to Mexico and the Bahamas. For the last 30 years he has been guiding at home (Amelia Island, Florida) from back country to blue water. Capt. Allen loves sight cast fishing (whether it’s for Redfish in the Backwater, or Cobia offshore). With a fly rod or light tackle, the thrill of seeing the fish before you catch it is one of the best highs in life. Capt. Allen also holds a current World Record for Bonnethead Shark (check out our Shark fishing tours). Winter fishing off shore is great when the weather lets you go. The sheepshead will be chewing on the reefs along with the seabass and both are great table food. Catching a 8lb sheepshead in 60ft of water is a blast on light tackle, sheepshead buck their heads and fight like a snapper the whole way up. Backwater light tackle fishing with live shrimp and artificial bait will produce some nice Trout like the one Alex is holding (3.5lbs). The sheepshead will be running in the backwaters all winter long and are one of the most challenging fish to catch in the backwater. The red fish will be schooling up on the low tides with the cooler water temperatures getting in the low 60’s and high 50’s. casting light tackle into the schools can produce some reds in the 30 inch range and this is also a great time to break out the fly rod. Couldn't have been better! I took my two daughters, 5 and 6, and we all had a blast. Lots of smaller fish for the kids to bring in by themselves, big ones for dad including a 100lb shark, and plenty to take home for a great dinner. If you're chartering in Amelia island, don't bother with anyone else! Edit: A few months on, and my daughter (6) still asks when we will see captain Billy again. I cant express how gracious, accommodating and friendly the crew was to me and my children. When we fish at home she now tells me "Billy would find the real big fish." An incredible day of fishing with Billy and Josh! Bull Reds and Permits! Looking forward to the next time. Thanks guys. I've been out three times with AC Charters. Twice with Allen and once with Billy & Josh. He is one of the best guides in Fernandina Beach. I've always caught fish with him He directed me to trophy sea trout over 6 pounds. Cap't Billy and Brandon were fantastic; incredibly knowledgeable and just good people. We had 5 people in our group and each of us caught a shark! 4 black fin and 1 spinner! After that we spent some time catching some Red fish; overall a great trip and I would highly recommend booking this company & Cap't Billy! Great times! Been fishing with Allen for 18 years. never been disappointed. last time out(week of thanksgiving 2017) put us on trout and reds all day. My children were on his other boat at the inlet and had big reds all day. can't do any better in Amelia than AC Charters. Very competent and personable captain that helped a dad and his two sons have a great day of fishing. Captain Allen. Fishing was a blast off the jetties and good fellowship with friends. Great day. Nuff said. This year was my 2nd trip with Captain Allen. Our kids had a great time and we would not consider using anyone else. With a potential for rain this year Allen even worked the schedule around to accommodate to ensure we got to fish. "We had a great time with Capt Alan and Cody. We went King fishing and did great then over to bottom fishing where we killed the sea bass. Anyone who has children or a family looking for a great time with a 5 star captain and mate then AC Charters is the way to go. Thank you again for the awesome fishing and fellowship look forward to coming back next year! Maybe we can keep a Snapper or two!" Took my 15 year old son out with Captain Allen and I'm sure glad I did because within minutes of arriving at the Jetties it was "Fish On!" We absolutely killed it!! We kept 52 fish for our Father / Son fish fry and as soon as we caught them Captain Allen would bait our hooks with fresh bait for the next catch. Now I see why his motto is "Stop Wishing and Start Fishing." We have already rebooked him for the fall season Bull Reds fishing trip. We had a great day of fishing!! Capt. Allen Mills was awesome! He put us on a variety of fish. Everything you could hope for and more. One of the many highlights was my husband reeling in a monster tarpon. Highly, highly recommend this charter service. Thanks again Allen. We'll be back.